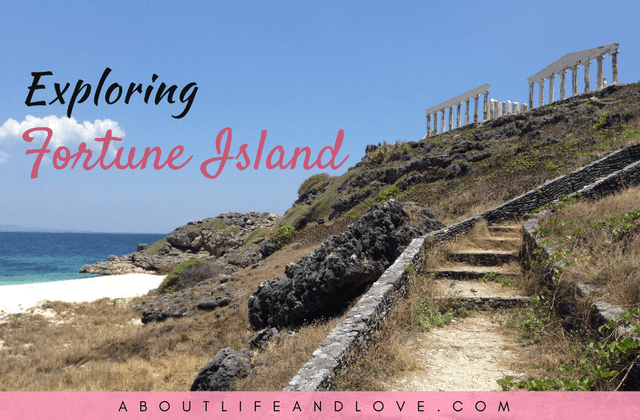 We went to Fortune Island (read more about the island here); an hour and a half away from Nasugbu, Batangas by boat. There were 16 of us. When we came to the island, I never regretted my decision of going. The scenery was stunning; bluish-green clear water, white sand, and the ruins, which added to the appeal of the place. Above the cliff at the far side of the island are columns, which resemble that in Parthenon Greece and some ruined statues. There were foreigners who were cliff-diving at the other end. Amazing what nature can make you feel. I felt totally alive just being there, I felt so relaxed lying by the shore. It was an even unreal experience just sitting there with the moon illuminating the night, witnessing it rise above, quietly sitting on the sand with a bunch of people talking/laughing behind me, and some discussing about photography. It’s like basking in God’s inexplicable love. The first on my agenda was to take pictures (of course! ), and so I took lots and lots of it. Or at least before my phone died on me. #morethingstotry and #moreplacestosee for 2014...checked! Really nice pics. Looks like you had a great time! You r indeed a globe-trotter!